Melbourne Unicorns have secured their first win of the 2015 Direct Connect #DewarShield season, defeating Power House in the competition’s Round Five Match of the Round. It was a tumultuous ANZAC Day at Orrong Park as both teams entered the contest without a win thus far. The home side looked in little doubt right from the first whistle, as a silky smooth display of Rugby in wet conditions saw them notch the first seventeen points of the match. RaboDirect Rebel, and this week’s Musashi Nutrition Player of the Match, Telusa Veainu was pivotal in establishing the early lead and seemingly untouchable with ball in hand, in a game that saw hard fought inside ball throughout. Power House lost the strength of inside centre Adam Millgate to an ankle injury late in the first half; credit must be given to both Melbourne and Power House, who between them had one doctor and two first aid physiotherapists on the scene before paramedics arrived, as injury time ensured the main break be cancelled and play returned as soon as the ground was cleared. Veainu scored the first try of the match, with Paul McConnochie converting before adding a penalty, and then Lucky Vunipola was next to score for the Unicorns as they got out to a great start, before Tom Kingston hit back for Power House to reduce the deficit to ten points as the first half ended with Millgate receiving treatment. Rain fell heavily for much of the second half and Power House was working overtime. A slippery ball and the uncompromising Unicorn line, however, made the deficit a herculean task. McConnochie had kicked truly all day and his second half penalty saw Melbourne extend their lead to 20-7. The hardened Power House outfit continued to press the defences though and had a great deal of possession, unwilling to drop their heads, as the ball went back and forth between fumbles and hits. Melbourne’s Vai Meni impressed in the conditions and kept his composure better than most, taking a terrific mark under pressure and making numerous searching runs on the right wing, however it was a Unicorns lock who put the game beyond reach as Aisea Koliavu touched down for the home side for the only try of the second half as the match finished at 25-7. 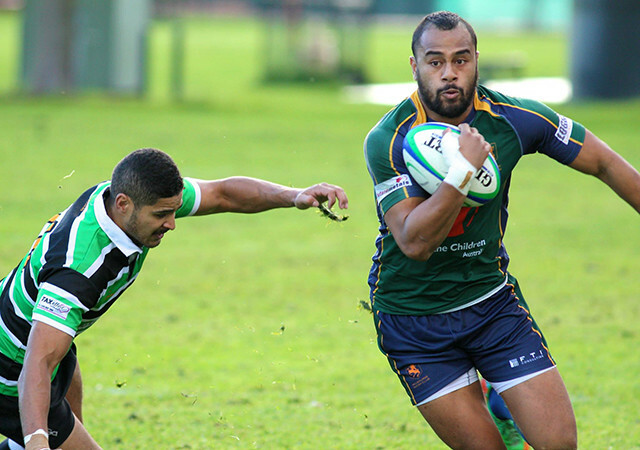 A vocal home crowd relished the victory, braving the conditions right down to the final whistle, and although they couldn’t secure a four-try bonus point it was a first win of 2015 for Anare Koliavu’s men. Round Six sees Power House host Moorabbin as they continue to search for a way to score more points, while Melbourne travel to in-form Harlequin in a repeat of the 2013 Dewar Shield Grand Final.